The Beantown Bloggery: 31 Cent Ice Cream at Baskin Robbins - TODAY! 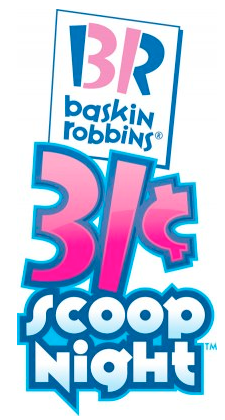 31 Cent Ice Cream at Baskin Robbins - TODAY! I remember the days when my friends and I used to spend the afternoon walking (while I was in college) from Ben and Jerry's to Ben and Jerry's for their free cone day. Coming up this evening is something that's close. 31 Cent Ice Cream at Baskin Robbins from 5pm to 10pm. Join us for 31 Cent Scoop Night at Baskin-Robbins® and help us honor America's firefighters. The Baskin-Robbins Community Foundation is donating $100,000 to the National Fallen Firefighters Foundation™ (NFFF). Participating stores will reduce prices of ice cream scoops to 31 cents*. At some locations, you may also have an opportunity to make a donation to your local fire charities. *Limit 3 2.5 oz scoops per person. At participating stores while supplies last. To scoop or not to scoop. That is the question. I could really go for some cookies and cream right about now. Too bad I'm trying to lose weight. 0 Response to "31 Cent Ice Cream at Baskin Robbins - TODAY!" Presale: Cirque du Soleil's OVO - NOW! Good Luck to the Runners! Backstreet Boys Tix On Sale Today! Rihanna & Ke$ha 8/8 Presale Going On NOW! The Great Burlesque Exposition - Starts Today!